A vigorous workout that lasts longer than 45 minutes can deplete your body of glycogen, the form of glucose your body uses for energy. Working out also causes micro-tears in the muscles. When your body heals the tears, it causes the muscles to increase in size. Recovery foods are particularly important to athletes who work out intensely every day. In addition to rehydration, a combination of carbohydrates and protein will help muscle recovery after a workout. Carbohydrates are important to replace glucose quickly and prevent the body from consuming muscle tissue for energy. Low-fiber, simple carbohydrates, like cereal, crackers or popcorn, are best for this purpose. Protein helps speed the healing time of micro-tears, leading to faster muscle recovery. The best ratio seems to be 2-to-1 or 4-to-1 carbs to protein. Registered dietitian Dena McDowell, who recommends a 4-1 ratio, suggests a snack of string cheese and a fruit bar or a meal of grilled chicken with pasta and vegetables. Certified personal trainer and nutritionist Mike Geary favors a post-workout smoothie of whey protein, real maple syrup, water and frozen bananas, balanced to have a 2-1 ratio. A 1999 study published in the "Journal of Nutrition" conducted by the University of Illinois concluded that foods high in the amino acid leucine sped up recovery time. Leucine converts quickly to glucose, resupplying the muscles after a workout and preventing the body from breaking down muscle tissue for energy. It also stimulates protein digestion and processing. Leucine appears in meats and dairy products, like steak, eggs and milk, as well as brown rice, whole wheat and beans. The amino acid is also available as a supplement, although excessive amounts can interfere with the absorption of niacin. Chocolate milk is surprisingly effective for muscle recovery after a workout. A 2009 study published in "Medicine & Science in Sports & Exercise" by James Madison University researchers followed two groups of athletes who played soccer. The first group was assigned a sports drink to consume after exercising, while the second group drank low-fat chocolate milk. 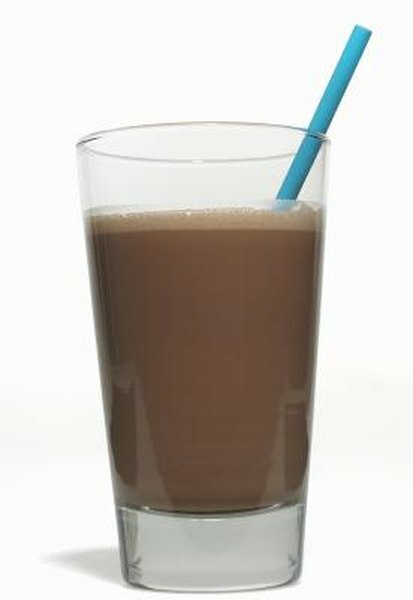 The chocolate milk group had lower levels of creatine kinase, a substance the body produces in response to muscle damage. Chocolate milk contains calcium, potassium and magnesium, which can all be depleted through vigorous exercise. Chocolate milk also has leucine and is a more economical alternative to sports hydration drinks. The Diet Channel: Post-Workout--What to Eat?